Snappy Program Lock was designed to be a professional security application for password protecting programs on your computer, portable computer or storage media. Easily restrict, block, deny access to applications, programs and exe files on your pc, laptop and usb drive. Not only does Snappy Program Lock limit access to programs run on your computer, it also logs the access attempts made to your blocked applications. 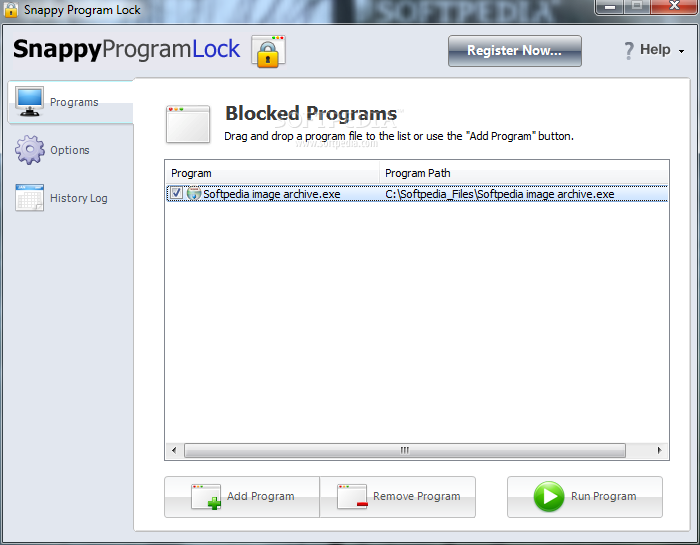 Snappy Program Lock was designed to be a professional security application. ...... was allowed to run. Your child, employee or other user can't uninstall Snappy Program Lock without your password. Show you what is really running on your computer. Qweas is providing links to Snappy Program Lock 1.0.0.423 as a courtesy, and makes no representations regarding Snappy Program Lock or any other applications or any information related thereto. Any questions, complaints or claims regarding this application Snappy Program Lock 1.0.0.423 must be directed to the appropriate software vendor. You may click the publisher link of Snappy Program Lock on the top of this page to get more details about the vendor.